Inspired by true events. In the 1930s, Baden-Powell and Von Ribbentrop, Hitler's ambassador, decreed that British boy scouts and Hitler Youth should learn from one another. In Bassington, England, the local troop play host to a cycling party of Hitlerjugend – but are the German boys cyclists or "spyclists"? For Will and Jacob, two Rover Scouts on the cusp of manhood, it is a visit that will change their lives forever. 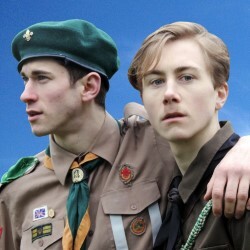 As war looms, a heart-wrenching, darkly humorous drama about espionage, scout's honour and forbidden love unfolds. From writer/director of Kids Play ***** (Bobby Award winner, BroadwayBaby.com).